Sweet Sadie's Baking: Chocolate Cake Yes another one! Chocolate Cake Yes another one! Place a picture of a pretty chocolate cake in front of me and you can be assured I will want to bake it. 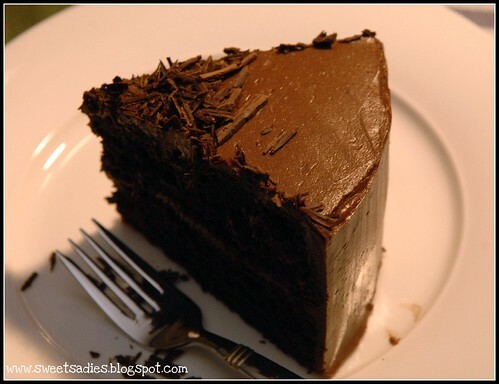 I love my mom’s chocolate cake, but the chocolate cake from Ina Garten is fabulous too. My mom’s cake is more casual and very easy to make while this one is richer and looks a little more impressive, for special occasions. I had just taken the cake out of the oven when my friend Sherman came over and presented me with this very special little gadget that I now love! It’s a Wilton cake leveler that evens out cakes, jelly rolls and other baked goods, so you have a flat surface to work with. I can’t tell you how many times I started shaving off the tops of my cakes with a knife until there was no top left. I would have a mound of crumbs sitting beside it...so much for a pretty cake, and what choice did I have but to eat the crumbs! The leveler is about $5.00 and is a great gift for bakers! After letting the cake cool, I asked Sherman, who is now taking a cake decorating class, to help me level and frost it. Sherman and I took baking classes together and I must say he is very good at frosting...really... really...sometimes painfully precise! I think the cake looked beautiful, but best of all, it tasted amazing! Adapted from Beatty’s Chocolate Cake from Barefoot Contessa at Home. 1 cup buttermilk , shake well! Butter 2 8-inch round cake pans. Line with parchment, then butter and flour the pans. Mix on low until combined. In another bowl, combine the buttermilk, oil, eggs and vanilla. Continue mixing on low and add the coffee. Scrape down the sides of the bowl and give it a short last mix. Pour into the pans and bake 35 to 40 minutes until a toothpick (or cake tester) comes out clean. Cool in the pans for 30 minutes then turn out on cooling rack and cool completely. Chop the chocolate and melt in a heat proof bowl over simmering water. Stir and cool to room temperature. Add vanilla and blend in. Turn the mixer to low, and gradually add the confectioners’ sugar and beat on medium, scraping down the bowl as necessary, until smooth and creamy. Dissolve the coffee powder in 2 teaspoons of hot water. On low speed, add the chocolate and coffee to the butter mixture and mix until blended. Place 1 layer, flat side up, on a plate. With an offset spatula or a knife, put a heaping scoop off frosting and spread evenly. Use the leveller or a knife to cut the top of the second layer (before placing it on the first layer) just enough to make it flat. Eat the cake you cut off to give you energy to continue! Place the second layer on top of the first. Put a good size scoop of icing on top and using your offset spatula, move it around and spread all over the top and sides. You can make it really even with this icing. Place 2nd layer round side up and put a good size scoop of icing on top and using your offset spatula, move it around and spread all over the top and sides, swirling it around. Not that I condone people making thier own birthday cakes, but I think Meredith should give this one a spin. Better than me trying the "cake in a box." Penny, I want to stick a fork into my screen. This is just gorgeous! I've never tried Ina's cake even though I have her books. I'll have to give it a go. I miss you!!! I would make it for Meredith if I was here, but I will be back the day after her birthday. Let me know if you want me to make it when I get home! I miss you too Ivonne! We have to get together soon. Absolutely the best chocolate cake I ever made. First time trying this recipe and loved it. Light yet moist. No kosher salt so used 1/4 teaspoon table salt. Frosted cake with an Italian meringue butter frosting slight chocolate flavour and sifted cocoa on top. I am so happy you liked it. Thanks for the tips!